Unusual entertainment, unique wares, a bouquet of aromas and a banquet of tastes greeted the neighborhood on the near southwest side of Grand Rapids, thanks to the Grand Rapids Symphony Friends. The Rumsey Street Bazaar, a three-day bazaar dubbed “Classics Remixed,” drew new fans for the Grand Rapids Symphony in the mostly Hispanic neighborhood of Grand Rapids. The event held last year in June 2016 was honored this summer by the League of American Orchestras with its Gold Book Award of Excellence.The Volunteer Council of the League of American Orchestras presented the award at the League’s National Conference, which was held in Detroit this past June. Symphony Friends President Bonnie Monhart attended the conference, gave a power point presentation and participated in a panel discussion on Leveraging Community Resources. The annual Gold Book competition recognizes outstanding projects created and implemented by volunteer associations of symphony orchestras throughout the United States and Canada such as Grand Rapids Symphony Friends. Projects are judged by the League’s Volunteer Council, an organization of recognized community leaders throughout the United States and Canada who have demonstrated outstanding support for their symphony orchestras. The Volunteer Council’s awards honor volunteers who, through hard work and dedication, help ensure the success of their organizations. During the 2017 League of American Orchestras conference, Grand Rapids Symphony violinist Diane McElfish Helle also was honored with the prestigious Ford Musician Award for Excellence in Community Service for her work in launching the Grand Rapids Symphony’s Music for Health Initiative. 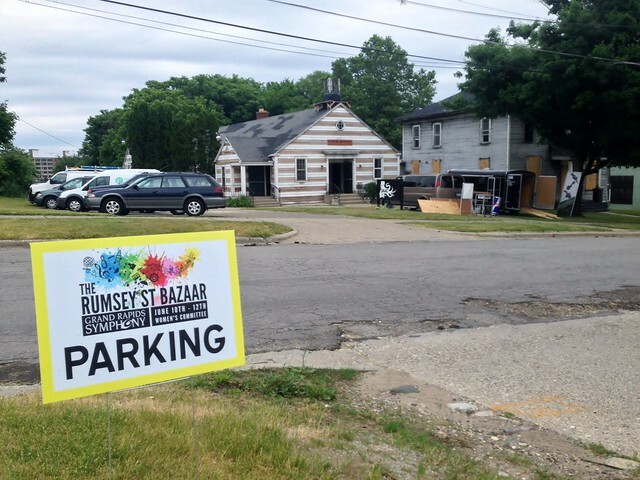 The Rumsey Street Bazaar was a multi-faceted event launched to foster an appreciation of classical music in a diverse neighborhood as well as to raise funds for the Grand Rapids Symphony. The eclectic group of community partners included New York designer Bradley Callahan of BCalla Designs, who has designed for such entertainers as Lady Gaga and who dressed Miley Cyrus and 31 drag queens the 2015 Video Music Awards. More than 50 members of Symphony Friends plus another 50 volunteers, fashion design students from Kendall College of Art and Design of Ferris State University, and 23 musicians from the Grand Rapids Symphony participated. The setting was a collection of buildings in the neighborhood of Rumsey Street and Grandville Avenue SW, now owned by Habitat for Humanity. During ArtPrize 2015 in Grand Rapids, the buildings were used by SiTE:LAB, an award-winning arts organization that creates site-specific art installations. The innovative bazaar featured a fashion show of “wearable art” together with a wide range of musical performances, a silent auction, ethnic food, arts and crafts and moderately priced resale items in buildings that included a deconsecrated historic Catholic church and an abandoned auto-body shop. Symphony Friends, formerly known as the Grand Rapids Symphony Women’s Committee, celebrated its 75th anniversary of service to the Grand Rapids Symphony in 2016.